The distinguished career of Texas-born cellist Ralph Kirshbaum encompasses the worlds of solo performance, chamber music, recording and pedagogy and places him in the highest echelon of today’s cellists. He enjoys the affection and respect not only of audiences worldwide, but also of his many eminent colleagues and students. Ralph Kirshbaum has appeared with many of the world’s great orchestras, including the Boston, Chicago, San Francisco, Pittsburgh, BBC and London Symphonies, Cleveland Orchestra, Los Angeles Philharmonic, Philharmonia, Zurich Tonhalle, Orchestre de Paris and Israel Philharmonic. He has collaborated with many of the great conductors of the time such as Herbert Blomstedt, Semyon Bychkov, Christoph von Dohnányi, Andrew Davis, the late Sir Colin Davis, James Levine, Kurt Masur, Zubin Mehta, Sir Antonio Pappano, André Previn, Sir Simon Rattle and the late Sir Georg Solti. 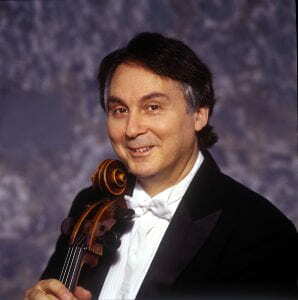 Ralph Kirshbaum has appeared frequently at such prominent international festivals as Edinburgh, Bath, Verbier, Lucerne, Aspen, La Jolla, Santa Fe, Music@Menlo, Ravinia and New York’s Mostly Mozart. In addition to his thirty-year collaboration with pianist Peter Frankl and violinist Gyorgy Pauk, he has frequently appeared with Pinchas Zukerman, Robert McDuffie, Lawrence Dutton, Peter Jablonski and Shai Wosner. Other recent collaborators have included Leif Ove Andsnes, Joshua Bell, Yefim Bronfman, Midori, Lang Lang, Vadim Repin, Joseph Swensen, Pepe Romero, and the Emerson and Takács String Quartets. Recent highlights include a return to the Verbier Festival, recitals in the UK with the Takács Quartet, a tour with the Scottish Chamber Orchestra, a residency at the Schleswig-Holstein Music Festival and an appearance with the Los Angeles Philharmonic Orchestra. In March 2014, Ralph Kirshbaum performed recitals with Shai Wosner in Belgium and Great Britain, culminating with a concert in London’s Wigmore Hall. Together they perform the cycle of Beethoven Sonatas and Variations this November in Tel Aviv and Jerusalem. A regular visitor to Australia, his most recent tour included concerts with the Adelaide and Sydney Symphony Orchestras as well as recitals and master classes. Bach forms an important part of Mr. Kirshbaum’s musical activities; he has performed the complete cycle of Bach cello suites in London’s Wigmore Hall, New York’s Metropolitan Museum of Art, and in Sydney, Edinburgh, Lyon and San Francisco. He has also made a critically acclaimed recording of the solo Bach Suites for EMI/Virgin Classics. In 1988 Ralph Kirshbaum founded the RNCM Manchester International Cello Festival, bringing together the world’s great cellists in a celebration of the cello, its music, its musicians and its makers. The last festival took place in 2007 and was awarded the prestigious Royal Philharmonic Society’s Music Award for Concert Series and Festivals. In 2012 he inaugurated the Piatigorsky International Cello Festival in Los Angeles to worldwide acclaim. The next festival, already highly anticipated, takes place May 13-22, 2016. A renowned pedagogue, he served on the faculty of the Royal Northern College of Music in Manchester for 38 years, and in 2008 accepted the Gregor Piatigorsky Chair in Violoncello at the University of Southern California Thornton School of Music. Following a sabbatical this fall which is filled with concerts and master classes in Great Britain, Sweden and Israel, Ralph Kirshbaum returns in January to assume the Chair of the String Department at the Thornton School. He continues to serve as Artistic Advisor of IMS Prussia Cove and is Founder/Honorary President of the Pierre Fournier Award, as well as Honorary President of the London Cello Society. He recently served a five year term on the United States President’s Committee on the Arts and the Humanities. The rare Montagnana Cello that Ralph Kirshbaum plays once belonged to the 19th century virtuoso Alfredo Piatti.